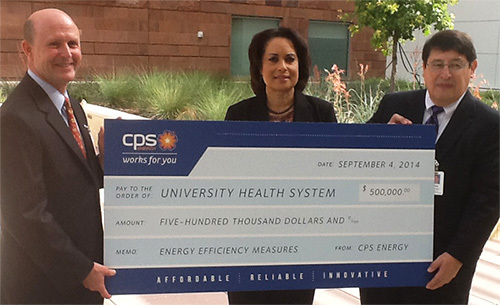 Today, CPS Energy delivered a $500,000 rebate check to University Health System as a rebate for energy efficiency improvements made as part of the recent expansion and redesign of University Hospital. In April, University Health System celebrated the completion of its new million-square-foot Sky Tower, a project that doubled the hospital’s size and transformed it into one of the most technologically advanced in the nation. A variety of energy efficiency improvements were completed as part of the project, including high-efficiency heating, ventilation and air conditioning (HVAC) systems; advanced LED lighting and use of artificial and natural light; and the use of high-efficiency building materials in exterior walls and windows. The new building was designed to consume 20 percent less energy than a similar building developed in line with normal building codes. “Through this project, University Health System demonstrates that any company can be energy efficient. If a 24/7, critical-care operation like a hospital can operate with energy conservation in mind, any business can do it,” says Jelynne LeBlanc Burley, CPS Energy’s executive vice president and chief delivery officer. CPS Energy’s incentives for new commercial construction are based on “whole building performance.” To receive a rebate for new commercial construction, a building should be at least 15 percent more energy efficient than City of San Antonio building codes. While University Health System exceeded these requirements, a $500,000 rebate is the maximum incentive allowed by CPS Energy for such projects. “University Hospital has taken energy efficiency to a new level – creating a project that is 20 percent more energy efficient than a similar project built to normal codes. This is an exceptional project and a model for others to follow,” Burley says. Through these initiatives, University Hospital is expected to save more than 11 million kilowatt hours annually. The decrease in energy consumption is expected to result in a cost savings of more than $900,000 per year. “The goal was to create a new hospital for the decades ahead, with capacity to serve one of the country’s fastest-growing metro areas,” says George B. Hernández Jr., president and CEO of University Health System. “It also had to be designed from top to bottom for the challenges of health reform — providing the highest quality care, as efficiently as possible, and focused on meeting the needs and expectations of its patients. This year, University Hospital also joined CPS Energy’s Demand Response (DR) program. The hospital, like other DR participants, voluntarily reduces its electricity use on hot summer days when conservation may be needed to ensure the reliability of the state electrical grid. Participants save energy during these events through customized energy management programs that may include: adjusting chilled water temperatures; reducing lighting, decreasing pump speeds and implementing other initiatives. Participants earn financial incentives if they reach designated energy reduction levels over a set participation period. So far, during each called demand response event, the hospital is reducing energy use by almost 1,000 kilowatts.